We hear a lot these days about Post Traumatic Stress Disorder (PTSD), especially related to the military but also in relation to anyone who has experienced severe trauma. It is important that we understand what these individuals are suffering and I would like to tell you my story. Group sizes ranged from 3 to 20 participants, homeless vets alongside retired officers. Most attendees came to only a couple of sessions, but there was a sizable block who were “regulars” attending dozens of sessions in the 3 years I was involved in leading the group. Most group participants had psychological and behavioral problems associated with Post-traumatic Stress Disorder. But as I listened to them talk about themselves and to each other, the most valuable lessons I learned from these veterans had more to do with their strengths than their weaknesses. First, one of the biggest tragedies of their military experience was not necessarily the PTSD symptoms of heightened anxiety, moodiness, nightmares, flashbacks, shame and/or horror of having witnessed or committed horrible acts. For many, the worst outcome of serving in that war was being robbed of the value system they believed prior to their service. Most Vietnam veterans volunteered in order to contribute to a cause they thought noble and worth their sacrifice: to protect a democratic way of life by providing a check on Communism. Unfortunately, after serving, many vets concluded that their sacrifice had been wasted by politicized leadership agendas and military tactics that made little sense. The veterans were disillusioned because they began to see they were being used by their country, rather than serving their country. Moreover, when those combatants returned home, their patriotism was attacked and shamed by the process of citizens involved a war-protest movement. Home was a place in which the vets no longer fit. They were hurting, alone and bitter about what they had seen and done. The ideals upon which they had decided to serve had been shattered. In the resulting “values vacuum,” only the misery of powerful PTSD symptoms was left. Additionally, they were rarely taught how to replace or renew the compromised values system. A second thing I learned from those Vietnam Veterans was the importance of the “platoon”, usually a squad of 10 or 12 men. Even though together for only 13 months, the bond that quickly developed among the platoon was very powerful and motivating. It was not uncommon in the group sessions to hear men talk about how much they cared for the others in their basic small unit. In fact, often it was only other vets these men felt comfortable with and/or trusted. I came to realize the healing power in those small groups. The Memphis Vet Center Monday Night Therapy and Support group became a “platoon” where vets could work with each other to rediscover or replace their lost values. Once they accomplished this values clarification, many found more strength to cope with the symptoms of PTSD because they became more receptive to learning the cognitive and behavioral skills helpful in rebuilding life after trauma. Since those days at the Vet Center, I have been honored to be involved in the treatment of many other folks who had traumatic events in their lives, including Childhood Sexual Abuse, motor vehicle accidents, crime victimization, natural disasters, and sexual assault. A common feature of these trauma survivors is this loss of belief in previously-held values. Values can be defined as life activities or behavioral outcomes considered important, even vital, in a healthy life. A partial list of values considered essential to healthy living would include but not be limited to perseverance, respect, honor, love, sacrifice, truth, freedom, compassion, bravery, kindness, wisdom, safety and trust. Clarity about what is important in life is often changed for trauma victims. Like the combat veterans’ loss of guiding patriotic values, survivors of Childhood Sexual Abuse (CSA) spend the first 8–10 years of life learning trust, only to find that it was no more authentic than a politician’s promise. Many battered spouses go through life in fear for their physical safety, only to have such fears confirmed by violence, thus eliminating a valuable sense of security. A vacuum is formed where once there was a strongly-held belief about an important feature of life. Without a sense of knowing what is important in life, trauma victims find less motivation to engage in the hard work of facing unpleasant symptoms. Avoiding the constant negative symptoms becomes their main focus of life. Even a brief examination of the history of humans shows an incredible capacity to cope with the most dire of circumstances when focused on values meaningful to the culture or social group at large. In the absence of those values, coping with hardship is greatly reduced, maybe even non-existent. Individuals have sacrificed much, even their own lives, when pursuing the “higher good.” But when not clear about that great good, victims tend to remain stuck in self-preoccupation. The values vacuum must be addressed to find increased motivation and strength in coping post-trauma. Since the main method by which we learn values in the first place is through social interaction with important people in our lives, group process is a powerful mechanism by which victims can examine changed values systems and begin to renew and replace them. A recent study (Kilpatrick, et al, 2013) reveals that over 80% of 3000 people surveyed report having experienced a major trauma. 80%! These traumas include physical or sexual abuse-53%; death of a family member due to violence-51%; natural disaster-50%; accident/fire-48%; witnessing physical or sexual assault-33%; and combat or warzone exposure-8%. Most victims of trauma (including most veterans of military combat) “get over it” in 12-18 months. But 20% don’t. They develop PTSD. What is the difference between the 80% who adjust and the 20 % who can’t “get over it”? An entire article can and should be devoted to the complicated concept of “getting over it.” For starters, even if victims can get past the trauma, their life narrative is forever changed. Plus, somewhere between 40-60% of folks who have a life trauma end up eventually saying that their life is better for it: an outcome called post-traumatic growth (Calhoun and Tedeschi, 2103). In fact, if one thinks about it, a good question to consider is WHY IS THERE NOT MORE PTSD, if over 80% of people report having had trauma in life? My experience with Vietnam veterans and other trauma survivors has led me to the conclusion that folks who “get over it” address the destruction of their values system in some kind of group interaction, formal or otherwise. PTSD is a disorder of “being stuck” in a never-ending cycle of avoiding the unpleasant experiences, believing and/or trusting in nothing once-valued and a lack of belief that something can be done to change this cycle (self-efficacy). In order to overcome the effects of trauma, a victim can’t just learn new skills to cope. The altered values system must be addressed. The sad fact of the matter is that traumatic experience drastically changes one’s life narrative. The purpose and meaning of the life traumatized are shaken to the core. That changed narrative must be re-written to include a new story line, one that rediscovers or replaces the lost value system. The second half of this two-part article examines the process of how one’s internal dialogue creates a life narrative and how that life narrative can be changed so that post-trauma reactions can become post-trauma growth. Dr. Jaremko has taught clinical psychology at the University level for almost 20 years. This academic activity has been balanced by the operation of an independent practice of clinical psychology for over 25 years. He estimates having taught over 2000 students through the years and delivered over 35000 hours of psychological services to around 10,000 clients. He has over 30 publications and nearly a hundred presentations at professional meetings on stress and trauma. In addition, chemical dependency and dual diagnosis has been a point of focus in his clinical practice. 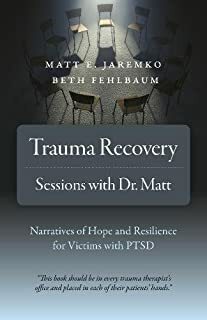 He, along with Beth Felhbaum-a trauma survivor, have written Trauma Recovery: Sessions with Dr. Matt: Narratives of Hope and resilience for Victims with PTSD which is available for pre-order and will be launched in December, 2018. We hope you begin to investigate this approach to trauma recovery through rearranging social interaction in healthy and progressive ways. Our new book, Trauma Recovery: Sessions with Dr. Matt is one way to visualize such a journey in that it describes in detail the narratives of seven trauma victims whose interactions with a therapist and each other achieved the needed changes to recover from trauma. While the book is on sale at Amazon and other booksellers, both Matt and Beth are committed to making a copy of the book available to anyone who is not able to afford its purchase. We can be contacted through our website, drmattbook.com. Please visit the Matt E. Jaremko author page on Facebook for more trauma recovery information.